Molly fish, including Balloon Mollies and Sailfin Mollies, are very interesting and easy-to-keep fish for beginners. They are livebearers and the females give birth during their lifetime. The baby Mollies are very cute that makes this species loved by beginners who want to breed and care for baby fish in their first fish tank. 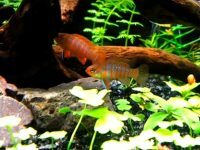 How to add new Mollies to your aquarium? Maximum length: male is 3.2 inches (8 cm) and female is 4.8 inches (12 cm). 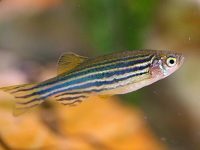 The scientific name of Molly fish is Poecilia Latipinna and they are usually found in Mexico, Texas and Florida, California and Virginia areas. They have a relationship very close to Guppies, both species are of the Poecilia genus. Molly is also commonly seen in home aquariums as well. And it does not need a fish expert so you can breed it easily. This type of fish can simply breed while it is in your aquarium. There also have some types of tail styles: Lyretail tail (moon tail) and round tails. Mollies can mate between different colors to give offsprings with new colors, so it is best to keep only one species in an aquarium to avoid interbreeding. Balloon Mollies are a shorter form of Molly fish. While the Sailfin Mollies possess a longer profile, the Balloon Mollies feature a shorter and cute body that is loved by many hobbyists. Mollies are sensitive to increased nitrogenous wastes and low water temperatures. They prefer a little salt with their water, they can live in fresh or brackish water environments. Molly fish can be found normally where fresh water meets salt water in various regions of the world. By adding ½ teaspoon of marine aquarium salt to every gallon of water, you will make your Molly fish very happy. Molly fish can be housed in a community aquarium that contains fish of similar size and temperament, as long as they share similar water requirements. Because this is a large fish, it should be kept in a large aquarium or a small pond with surface area being more important than depth. The tank should have many aquatic plants and decorations, plants help to increase the water aeration and provide hiding place for the fish. In addition, the plants also provide a little vegetable food source for Mollies. 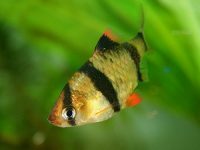 At least a 10-gal tank for 2-3 Balloon Mollies or a 20-gallon tank for 4-5 Sailfin Mollies is recommended to keep the fish happy and healthy. It is best that you have more than two females for every one male in each tank as males are more aggressive towards each other. 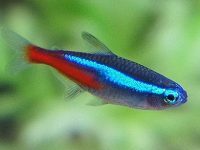 Molly fish live harmoniously with Tetras such as Silvertip Tetras and Black Skirts. They also are good with Guppies, Swordtails, Platy fish, Zebra Danios, Minnows, Gouramis, and Catfish. They do get along with Plecos fish, but, if you add a Plecos fish, place only one. These guys don’t like competition. Since they also like their algae, they may not leave very much for the Molly fish to eat. 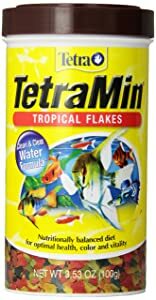 Feed your existing fish before adding the new fish to make sure they don’t think the new mollies are food. Lay the bag of new coming fish in the tank for at least 10-15 minutes for the temperature equilibrium. Using a fish net to transfer the fish to your tank without introduction of the water from the bag. Caring your new fish follow the instructions in this article. 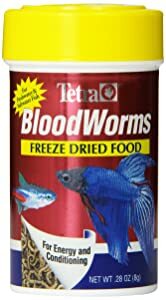 Molly fish thrive on vegetable flake foods combined with either live or dried blackworms or bloodworms. Provide them with a diet high in algae content, including Spirulina-based flakes, as well as parboiled fresh vegetables, such as romaine lettuce, green peas, string beans and zucchini slices. 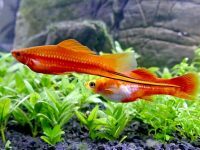 Read the guide about fish foods and feeding: https://lovefishtank.com/best-freshwater-fish-food/. 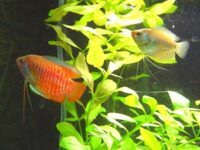 The male Mollies is easily distinguished from the female as the male Sailfin is usually smaller in size and much slimmer than the female, and has a gonopodium. The male also has a sail dorsal fin which is absent in the female. The dorsal fins in males usually develop after two years of age. Breeding can be accomplished if sufficient space is provided (20-gallon tank or larger) to facilitate the mating. Usually, it takes only 40 up to 70 days before the gestation period ends. There will be at least 20 live young Mollies in a female but sometimes she can have as much as 60 live young baby Mollies inside. When the belly of the pregnant Molly is very distended, it is about to lay. Everything you need to do is creating a quiet place for the fish to give birth. 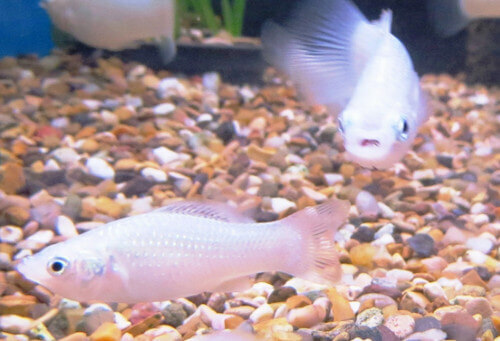 The male Mollies and other fish in the community aquarium can cause stress on the pregnant fish if you don’t do any thing to protect the fish. Stressed pregnant mollies can cause more aborted births and stillborn. 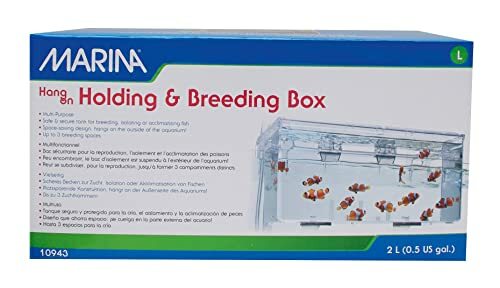 You can use a breeding box or a separate tank to prepare for breeding Molly fish. By this way, you can protect the pregnant Molly as well as its baby fish. If you lay the female give birth in the community tank, your aquarium must have enough plants to provide hiding places for the little fish. They would eventually leave the plants if they are already big enough to swim and not to be eaten by other fish. A single female can produce 20-60 baby Mollies once time. Once all the babies are born, transfer the female into a protected section of the main tank for it to rest as well as prevent the fish from eating its babies. The baby Mollies swim freely after birth and grow relatively quicker. They do need a lot of attention as they are easily prone to diseases. 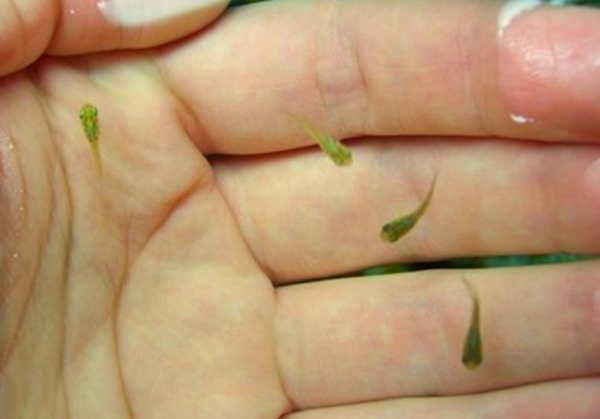 The baby Mollies can be fed daphnia, egg yolk, newly hatched brine shrimp, or commercially prepared baby livebearer food. After a time, you can use tropical flakes or pellets to feed them until they get mature. Live fish foods like black worms, grindal worms, and blood worms help to boost the raising of baby Mollies. In nature, the primary food of Molly fish is algae, so you could add some aquatic plants to the fry tank to provide them a place for hiding as well as supply some vegetable foods. You should feed the baby fish just enough to avoid dirty water harmful for the fish. Waiting until the babies get mature (it ‘s regularly around two months until they’ve doubled in size), introduce them into the community aquarium with the other larger fish. Remember to feed the fish in the tank before applying the new Mollies to ensure that they don’t think the new comers are foods you give them. My molly is black with small white spots and a bit of orange spots anyone know what type of molly that is?? Just wanting to know what type of molly I have. The black molly with white spots is Dalmation Molly.